“Écureuil” (squirrel), “Serrurerie” (locksmiths), “chocolat”… These French words are typical examples of words that are difficult to pronounce for an English speaker. Some French sounds are typically difficult to pronounce for an English speaker. So, saying something as common as “une rue” (a street) can be quite a challenge. Words such as “une serrurerie” (locksmiths), “l’aurore” (dusk), “la fourrure” (fur), “une huitre” (oyster), “un truc” (a thingy) or the name “Hélène” all fall under this category. With so many silent letters and no strong tonic accent, what often puzzles English speakers is how to sound out a French word. In other words, they have a hard time linking the written letters to their correct pronunciation. This is the case of the words “en haut” (upstairs), “un pneu” (tire), “une feuille” (leaf), “l’eau” (water) or the city of “Rouen”. They are all very easy to pronounce once you don’t let all the letters fool you! Many English speakers have a hard time with “chocolat” which they pronounce “tchocolayt” when in French it’s “shocola”. It’s not difficult to say “shocola” for an English speaker. So it’s not the sounds themselves that are difficult. It’s just that their brain automatically links the letters in “chocolat” to the English pronunciation. French and English share a lot of words, but their pronunciation sometimes differs a lot from English to French. English speakers should be prepared to make an extra effort to pronounce these words the correct way in French. So, how can an English speaker get these words right? Here are my solutions to be able to pronounce difficult French words. 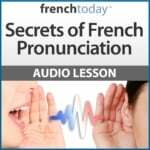 Learn the rules of French pronunciation. Most students just “wing” their French pronunciation. They try to mimic the French, and mostly guess how to read French. However, there are very clear rules about French pronunciation and how to read French. Like an “s” between two vowels becomes a “z” sound. To keep a “s” sound, you double the “s”: poison (Z – poison) versus “poisson” (S – fish). Learn how to place your mouth, tongue, lips for the difficult French sounds. Many English speakers have a hard time with the French “R”. They just try to mimic what they hear, but it’s not always enough. Knowing exactly how to place your mouth, tongue and lips is a huge help. To make a French R sound, roll an R like in Spanish, or gargle, then press your tongue firmly against your LOWER front teeth. Your tongue will make kind of a slide: it will be high and rounded towards the throat area, and flat/a bit curled up on your front teeth. Try it! Say “Paris”; make sure the tip of your tongue presses firmly against your lower front teeth. Let me know in the comment section how this is working for you! Learn French with audio first. A lot of French words are actually easy to pronounce for English speakers. More often than not, it’s the way the word is written which fools the students of French into a wrong pronunciation. For example, “l’eau” (water) is pronounced “lo”. It “looks” much harder than it sounds. So, first, learn the correct French pronunciation with audio. Then learn the way French is spelled.